The African Venture Philanthropy Alliance (AVPA) in partnership with the United States International University-Africa (USIU-Africa) and the United Nation’s SDG Partnership Platform are organizing the 2019 Agripreneurs Congress at USIU-Africa (Nairobi, Kenya) on June 6-7, 2019. 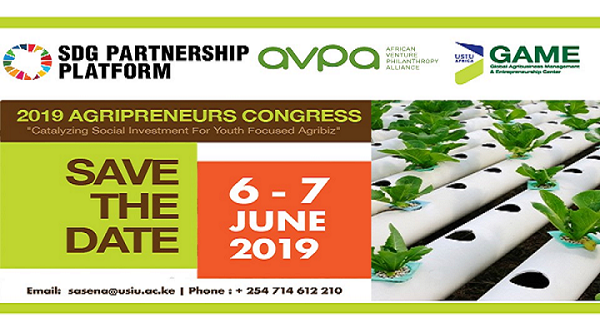 The two-day gathering seeks to enhance sustainable collaboration and sharing of knowledge among key players in the agribusiness arena. The theme of the conference is “Catalyzing Social Investment for Youth Focused Agribiz.” It is our belief that the power of transformative venture philanthropy/social investment (VP/SI) can be more fully leveraged across the region. 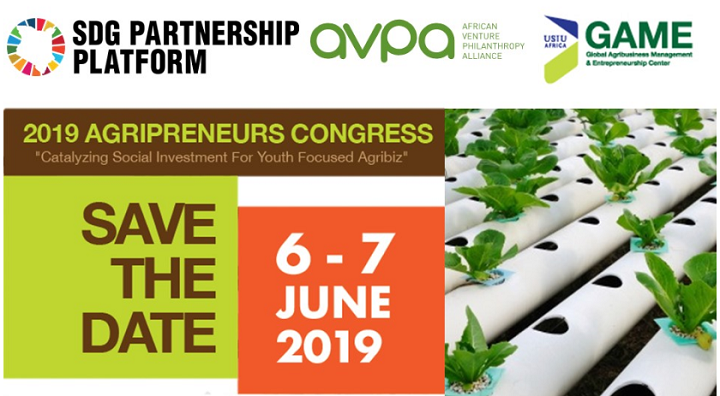 This is an exciting time and opportunity for us collectively (development partners, philanthropists, researchers, policy makers, civil society, and corporate entities) to shed light on this topic and resolve to find innovative solutions that will help the youth of Africa actively engage in and drive this sector.